What was I supposed to do, not report the results? Our results thus suggest that red and pink adornment in women is reliably associated with fertility and that female ovulation, long assumed to be hidden, is associated with a salient visual cue. As Kim Weeden pointed out when I mentioned this on Twitter, Andrew Gelman used that paper as an example of how researchers have many opportunities to slice findings before settling on those that support their hypotheses. If the red-dress effect is driven by a desire to increase one’s sexual appeal, then it should emerge most reliably when peak-fertility women have few alternative options for accomplishing this goal (e.g., wearing minimal clothing). 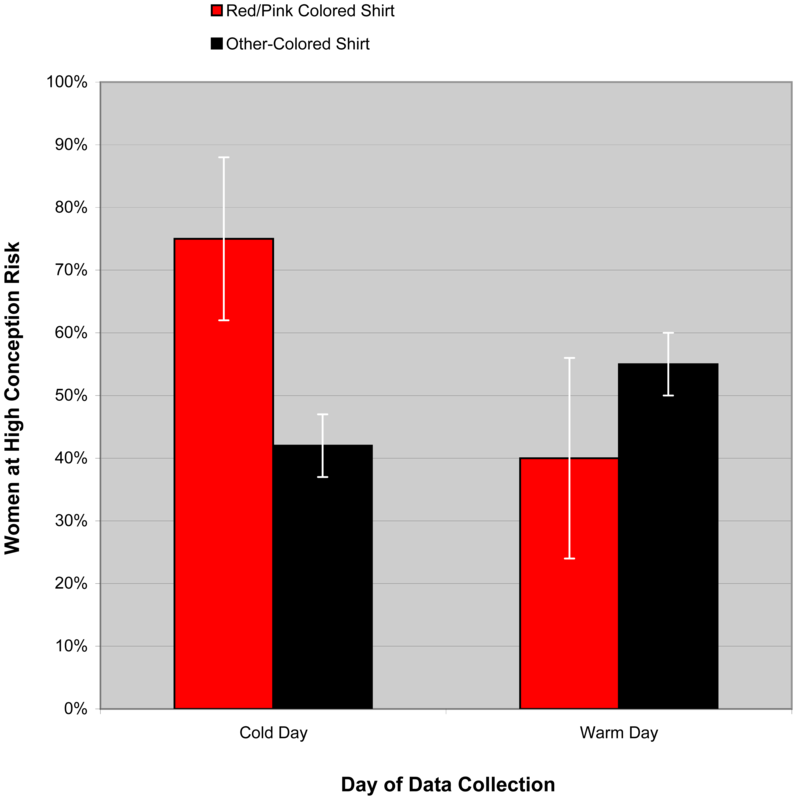 Results from re-analyses of our previously collected data and a new experiment support this account, by demonstrating that the link between fertility and red/pink dress emerges robustly in cold, but not warm, weather. And here it is. Happy, Gelman? Since I am teaching love and romance in my family course this week, I thought we should add something to the conversation. I only did one exercise, and I am reporting the full results here. Nothing hidden, no tricky recodes, no other questions on the survey, no priming of the respondents (it was at the start of the lecture). 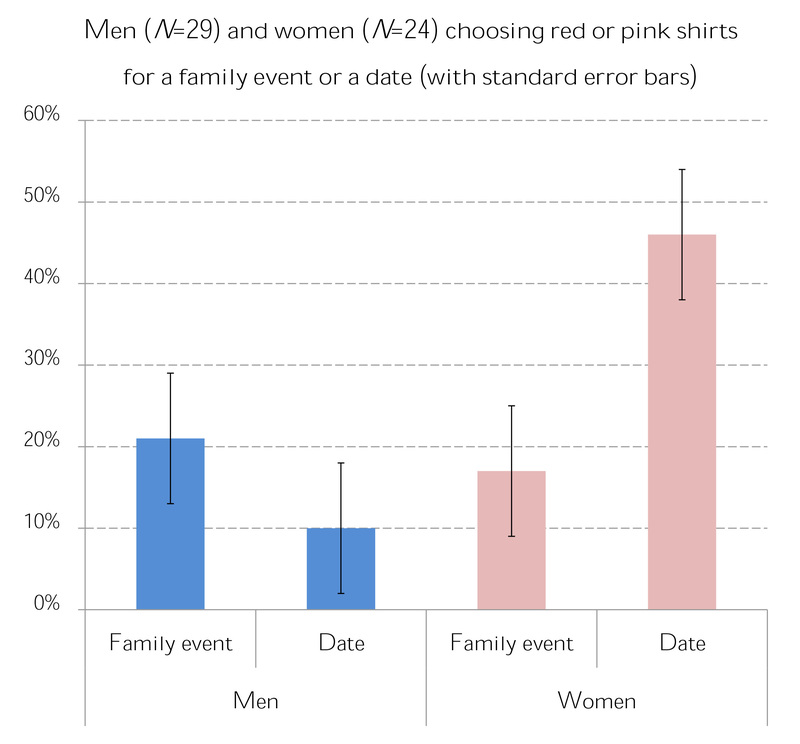 The statistical test for the difference between date and family event for women is significant at the level of p<.035. This is not research, it’s just a classroom exercise (which means no IRB, no real publication). But if it were research, it would be consistent with the women-wear-reddish-to-attract-mates theory (although without the menstrual cycle question, its contribution would be limited). Most sociologists might not go for this kind of stuff. Maybe it’s a slippery slope that leads to unattractive conclusions about gender inequality in the “natural” order. My perspective is that I don’t care. Of course this is not really evidence that evolution determines what American (or, in the case of the Ethos paper, Slovak) students wear on dates. But it doesn’t refute the theory, either. For previous posts in the series, follow the color tag. The important factors that influence color selection operate at some primordial (primate) level that is out of awareness. 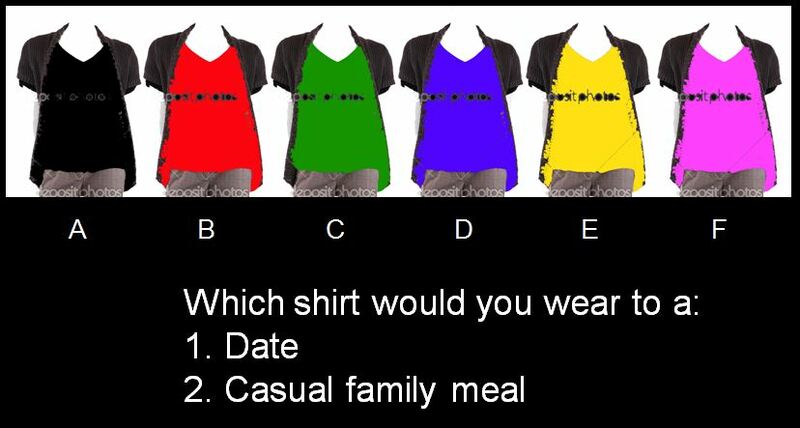 So there might be a difference between what students say they would wear and what color they actually choose. In any case, you have to repeat this exercise late in the semester when the weather gets warm. When you do, take a color photo of the class to see who’s wearing what. And don’t forget to include that question about where in their cycle they are. model was red (Bielert et al. 1989).”I actually think there are better things to do than be cruel to animals. Who cares and why does it matter? I have always worn black and red in Winter never in Summer, make of that whatever you like. Hey – that’s not my quote! I do not do research on non-human animals. No primates were harmed in the administration of my survey (every student got an attendance point). Cruelty to animals – does it matter less than discovering whether women wear red when they’re fertile? Aware of that but you used the results, guilty by association? No. If I “used” the results to make a profit (or sell cosmetics), maybe. But reading and discussing a study for educational purposes? Hardly. Fair enough. Your call. My opinion is my own. Right. No accident that Target developed that algorithm to figure out who was pregnant. Ok, I have some questions about all this: first and foremost, what is the causal link? What’s the theory behind the empirical investigation? How can you disentangle culture from nature, and most important, cultural changes. How can someone have primate instinct when primate didn’t even had clothes and when in nature -i believe- colors are usually a male feature, and not a female one (unless all the documentaries lied! I’m not biologist). The second is more directly related to the study, and, leaving aside the number of observations and the sample design, what about individual effects? Did they follow these women over a period of time? Did they ask them if red or pink where they’re favourite colors? And how are they addressing environmental circumstances, like fashion (it may seem trivial but sometimes you hardly find anything different from the main stream fashion in stores, so if this season is blue and green and yellow good luck finding something pink) or the fact that most women wear is, actually, red or pink. Especially spring and summer clothing. So, yeah, what about reverse causality? I mean…ok, maybe I’m raising trivial question, maybe they have been addressed, but I don’t think they are irrelevant. Especially the theoretical background, is something more and more dismissed these days, while it should actually be the core. Don’t get me wrong, I know how research goes in social sciences, still I find this kind of things slightly worrying. The Maryland colors leave me confused; perhaps that is the intent?